Simplifying the notes across the fretboard can make it easier for you to master them. In the last installment of my "Absolute Fretboard Mastery" series, we touched on mastering your open chords, your barre chords and the notes along your fifth string. It’s been about a month since then, so I hope you’ve practiced hard and that you’re ready for this month’s installment. Today we’re going to pick things up where we left off by tackling the notes on the fourth string. And remember, we’re going to be focusing on the prime pitches — that is A, B, C, D, E, F, G — like we did with the fifth and sixth strings. I do this because I’ve learned that simplifying the notes across the fretboard can make things easier for students to master them. And once you’ve learned where these seven notes are on the fretboard, playing them as sharps or flats simply becomes a matter of moving up or down a fret. Again, when memorizing these notes on the fourth string, I want you to cross-reference each of them with the fifth and sixth strings. So for example, when memorizing the E on the second fret of the fourth string, you should cross-reference that with the same note on the fifth fret of the fifth string and the 12th fret on the sixth string. Another little shortcut I want to point out at this point is how, when playing your power chords, the octave of your root note on the sixth string will be two frets higher on your fourth string. For example, when you’re playing a fifth-fret A power chord on the sixth string, the octave of the A note will be on the seventh fret of the fourth string. This is another little tool to help you visualize your notes and cross-reference them across the fretboard easily. Turning this into a blues scale is as simple as adding the note on the sixth fret on the fifth string. This is also called a flat fifth. This blue note is a note that guitarists aim to include in their licks when playing the blues. But the problem with this note is that if it is emphasized, it results in a diminished sound that can sound pretty awkward. So when using this note, it is always important to use it in conjunction with other notes and never as a target note. For example, if we were to solo in the key of A minor, one of our target notes would be A. But what we can do is introduce the blue note in conjunction with other notes in the key of A minor to add a lot of color to our licks. Another thing you will notice at this point is that when you continue down this scale into the next octave, you’ll also come across the octave of the blue note. So for example, if you were to continue down the A minor pentatonic in this first position, you’ll notice that you’ll come across the blue note again on the eighth fret on the third string. Remember, we haven’t even started talking about specific licks and patterns that we can use the blue note in. So what I want you to do for now is to start using this blue note when meandering in your minor pentatonic scales. Once you’ve got the blue note mastered in all five positions of the A minor pentatonic scale, I want you to practice using it in and memorizing it in all other minor pentatonic scales. 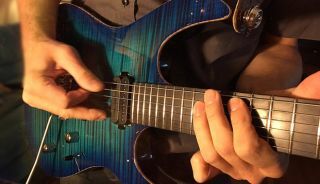 This way once you’re ready to use the blue note to create a lick or a solo you’ll know with absolute certainty where your blue notes are located across the entire fretboard. The blue note is going to end up visually in a similar spot, on the third fret of the second string. This is called a raised second or a flat third. Theoretically, this is different from the blue note in the minor pentatonic, but what I want you to notice here is how adding the blue note in a minor pentatonic and major pentatonic is visually similar. Again, what I want you to do is to start using this blue note when meandering in this first position of A major pentatonic. Once you’ve mastered that, move onto including it in all five positions. Once you’ve done this, you can start memorizing this note in the five positions of all other major pentatonic scales. The next thing I want to talk about is a concept I use in meandering called the “Rhythm Pyramid.” When we think of a pyramid, we picture a large base that tapers off into a small top. As far as guitar playing goes, whatever we play on the instrument is based on pitch and rhythm. Rhythms are whole notes, half notes and quarter notes and so on, all of which tends to get confusing at times. So what I want you to do is look at rhythm like a pyramid. By doing this, all you have to remember is that a whole note is worth four beats. A half note is worth two beats. A quarter note is worth one beat. An eighth note is worth half a beat. And a 16th note is worth a quarter of a beat. Visualize this: When we move up our rhythm pyramid, we’re going twice as fast as the earlier count; or, in other words, using phrases that are half the size. Coming back to the concept of meandering, what we’ve been doing so far is training ourselves to meander without stopping. This isn’t necessarily that musical, but what we've been doing is getting our brain and our hands comfortable with moving around constantly on the fretboard. In last month’s lesson, we worked on adding in some pauses into our meandering. This is what I want to elaborate on today. When we think about creating phrases in a guitar solo or passage, we can use pauses or complete stops. So this week, I want you to practice including these pauses and stops into your meandering to break it up into different phrases. When doing this, you’ll notice how things are starting to sound more and more musical. The more you work on this, the better you’ll get at it, and it's at this point that you’ll start to get a feel for how long you should play a particular phrase and when you should stop. The next thing we’re going to do is introduce our idea of a rhythm pyramid into this meandering. Earlier, we were moving at one speed with notes of the same length. Now we can start thinking about using whole notes, half notes, quarter notes, eighth notes and 16th notes to create to create various melodic phrases. The last thing I want you to do this month, which relates to the technical side of things, is go back to a video of mine on GuitarWorld.com called Three Steps to Shred: Fundamental Daily Practice Techniques in About 15 Minutes and start incorporating its techniques into your daily practice. As we progress through this series, you’ll start to notice how the basics we touch on during the earlier lessons start coming together to lead into more advanced concepts, so I hope you keep up and you keep internalizing the techniques I teach every lesson. Check back next month for the Part 4 of "Absolute Fretboard Mastery" — and keep practicing hard! LessonFace.com offers live online music lessons via videoconference, allowing you to access top teachers in a wide variety of instruments from anywhere with a broadband connection. More information about live online lessons with Steve is available at lessonface.com/player.